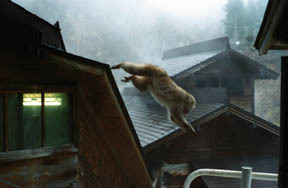 The snow monkey which flies a Snow-Monky-Park & jigokudani! * Snow Monky Park (snow monkey park) : the adult of 500 yen. A Japanese macaque is no charge. The dog and the cat of the natural enemy of the snow monkey cannot come in. 9:00 -. * Stay has a kanbayashi of the Iriyama mouth besides the isolated lodge "Kourakukan" of a jigokudani, a shibu, Yudanaka Onsen, etc. Please carry out move expansion of the google map, and move on.